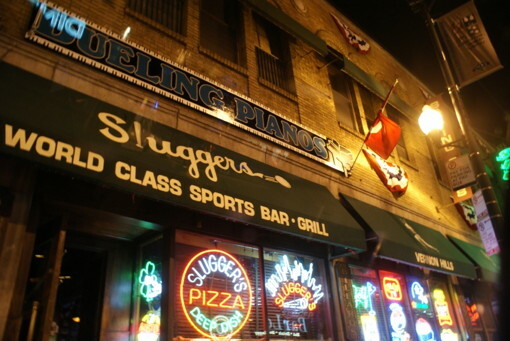 The canopy over Sluggers bar, 3540 N. Clark Street, reads "World Class Sports Bar." This morning, they forgot the class part. It all started around 12:10AM when Sluggers security kicked out four male, Hispanics in their 30's for using drugs in the bar's bathroom. Police were called after the men stood outside and threatened to bust out the bars windows. An officer responding to the previous call was flagged down by security at the nearby Cubby Bear bar to handle a problem in the rear parking lot. Then, a third disturbance broke out in the alley behind Sluggers at 12:45AM. Things stayed calm for nearly 45 minutes, until another fight broke out on the sidewalk in front of Sluggers at 1:25AM. The highlight of the whole mess came a little before 2 o'clock when officers ran a license plate check and found a rental car that had been reported stolen from Sluggers by a Texas man. Police are attempting to make contact with the car's renter.